The EF4 (at least) tornado that hit Moore, OK, on May 20, 2013. Picture originally from Fox 59 News. My phone rang at 10:28 last night. It was my sister. “Oh, I’m sorry for calling so late,” she said. “I didn’t realize what time it was.” Because that’s who she is: the kind of person who worries about being rude even though she’s trying to find her way home down the few streets not blocked off by police or debris in the aftermath of yesterday’s EF4 tornado in Moore, OK, one of the most destructive tornadoes in history. Seven hours earlier, thanks to the magic of social media, I’d found out about the tornado within minutes of its touching down. Immediately I called, then texted my sister. The call went straight to voice mail, which I told myself was probably because lines were down. No answer to the text. I then texted all of my siblings and their spouses that I could (note to Apple: there are PERFECTLY LEGITIMATE REASONS why someone might want to text more than 10 people at a time; stop making me choose which family members to leave out!) to ask if anyone had heard from her or her family. No one had. And the tornado was still on the ground. As the news unfolded, my amateur meteorologist husband figured out that the tornado’s track had come close to, but probably not hit, my sister’s neighborhood. Even if it had, I knew that my sis (and her husband, if he were home) would be in their tornado shelter. They are reasonable, cautious people, the kind who do all scheduled maintenance on their vehicles and prefer to pull over rather than talk on the phone if they’re driving. And if my brother-in-law had been working, he’d have been even more out of harm’s way. So we were concerned but optimistic. Three hours later, when we still hadn’t heard anything, we were starting to get a little more concerned. I kept searching hashtags on Twitter, checking the Red Cross Safe & Well site, and watching eyewitness and news videos on the off chance that I’d see one of them. 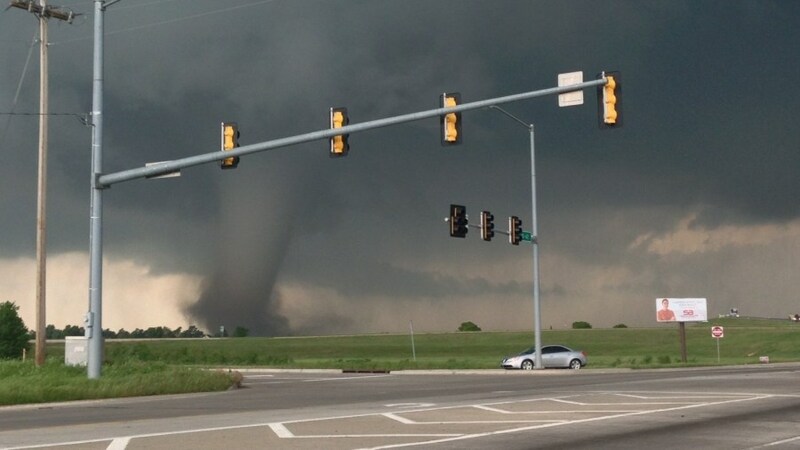 Then we found out that my brother-in-law and the son who still lives at home were fine, but that my sister wasn’t in their tornado shelter—because she was working that day as a substitute teacher at one of the schools. Fortunately it wasn’t one of the schools that was hit, but it was very, very close. And also, what if she’d been leaving for the day? What if she’d been driving home? We just didn’t know, and it had been four hours. FOUR HOURS. My husband said if she was there, she was helping, because, you know, teachers. And also, that’s my sister. I knew he was probably right. But … four hours is a long time. During that time, interspersed with bouts of worry, I thought about my memories of my sister. I have three sisters, and they’re all special and important because SISTERS, right? This one, though, was a kind of pseudo-mom, in the way that sometimes happens in large families. She was a tween when I was born, and some of my earliest memories are of her taking care of me and my little sis. Making us homemade pizza. Singing “You Light Up My Life” to us. Teaching me how to read after I dropped out of kindergarten. (Long story.) Important stuff, you know? Finally, FINALLY, I got a text letting me know she was okay. Not from her, but from her daughter in another state, who’d heard from her dad (my brother-in-law), who was texted by my sister on a borrowed phone because hers didn’t have service. She was okay. She was okay. We didn’t know the details, but I was fine with that, because we knew the most important thing. I don’t think I’ve ever been so relieved in my life. As it turns out, my husband was right (he usually is, which is a trait that is sometimes annoying but was in this case gratifying): she was helping at the school, staying until the last kids were on buses. And then, while she was struggling to find a way home through the destruction at 10:30 last night, I got her call. Next time I see my sister, I’m going to give her a very squeezy hug. There must be thousands of people with loved ones in and around Moore who went through basically the same thing my family and I did yesterday, and I’m sure they’re all equally relieved. Unfortunately, there are dozens who won’t get that call that says “Hey sis, hey Mom, hey Dad, I’m fine.” And I’m so sad for them. Because regardless of what you believe, regardless of what comfort you might or might not find in those beliefs, none of us want to let go of the people we love in this world. It hurts. Eventually, though, we all have to. Sometimes it’s sudden, like a tornado ripping through an Oklahoma town. Sometimes it’s slow, like the long end of a longer illness. None of us really know how. None of us really know when. All we have for sure is right now. Right now seems like a very good time to call someone, to visit someone, to hug someone. Doesn’t it? Oh, Evelyn, I’m so glad you sister is okay! That tornado was really terrible. And thanks for the reminder to call someone you love. I just saw most of my family last night and I try to remember to be sooooo grateful for all of them. It’s really easy to get caught up in the day-to-day, isn’t it?